The newest must have watch for the all so populat geeks, comes from Tokyoflash, a Japanese brand. 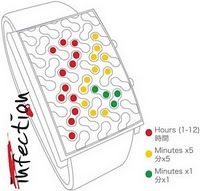 The watches name is Infectious, probable because of the bacteria lookalike pattern. The timepiece features a unique pulsating three color LED display - once again with the characteristic hard-to-tell-the-time look. So, this is an accessory for all of you who have plenty time...on your hand. But is can also be a plus, for those moments you just feel like being a big - outrageous show off. Featuring a creatively designed full face mirrored lens and an innovative way to view time, no one is immune to Infection. Finished with a matching leather band and stainless steel clasp. Manufactured in a smart new case, Infection is ergonomically designed to neatly fit the contours of your wrist, the tapered edges providing a smooth transition between the case and lens.So, just in case you didn't get how do you read the time on the Infection (this sound stupid, I know...just bear with me), here is a simple sketch that will give you all the information you need. 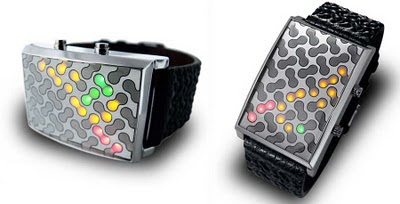 It has twenty seven multi-colored LEDs pulsate and move like cells across the curved face to present the time from beneath the attractive mirrored mineral crystal lens. Twelve red LEDs indicate hours, eleven yellow LEDs represent the progression of time in groups of five minutes and four green LEDs show single minutes. A single touch of the upper button animates the LEDs, a single touch of the lower button shows the time immediately. Infection is about $135 USD, which is pretty expensive, considering you usually get it for free. OK, I just have to say it: BAD name idea!!! But I love Tokyoflash, with all it's geeky stuff!